Life in Canada | * Not necessarily about life. Not necessarily about Canada. Remember that time everyone aboard The Enterprise starts playing that addictive game that Commander Riker picked up on Risa (along with, I’m certain, any number of STDs)? Synopsis of s06e05 here. It was a Trojan Horse designed to mind-control the crew and it damn near succeeds, except for the fact that Wesley Crusher is skeptical refuses to play. This gives him enough time to fix Lt. Data who was scuttled by a saboteur. Wesley is eventually held down and forced to play the game. But then Lt. Data arrives, strobes some light around the ship, and saves the day. Now I’m not saying Pokémon Go is a Ktarian scheme to take over the world. But I’m not saying it isn’t, yet. A year ago, I listed my favourite podcasts. In that time, I’ve found others and re-assessed my favourites. My main criteria is this: when I see it my feed, do I want to play it before everything else? #1 – Radio Lab: I used to view it like This American Life. But it’s quite different. I like that informal-sounding banter as the producer walks Jad Abumrad and Robert Krulwich through the story. It’s edited to make it feel like all the interviews are cued up and played live for Jad and Robert on the fly. #2 – Reply All: The guys at Radio Lab put me on to this one. It has a similar storytelling style as Radio Lab (someone reports, others comment) but the stories all have a loose Internet connection. PJ Vogt and Alex Goldman have an even more conversation tone than the super conversational tone on Radio Lab. Love this podcast. #3 – This American Life: This is one of the most popular podcasts. It’s also on public radio, so you may have heard it. It is a series of stories organized by a theme. These are extremely well-crafted but the conversational tone makes it feel unlike anything you normally hear on the TV news magazine shows or the evening news. But be warned: Ira Glass’ manner of speaking will slowly creep into your own if you are not careful. #4 – The Memory Palace: I love listening to these historical stories that Nate DiMeo puts together with the perfect music and delivery. People have compared it to Paul Harvey old radio program The Rest of the Story. But this one is much better, in the way that The Sopranos was better than, say, Dallas. #4 – Serial: Season 2 of Serial is less addictive than Season 1. But it is a well told story. I’m excited when it appears on my podcast feed. #5 – Freakonomics Radio: Unlike the first three on the list, Stephen Dubner does the reporting, narrating himself. Although it lacks some of the emotional appear of the first three, you feel smarter after listening that with almost any other podcast. #6 – Invisibilia: This one has been on for a while. Keeping it on this list because it was good in that way Radio Lab and This American Life is good. Stay tuned. #7 – The Moth Podcast: Real stories by regular people (although a lot tend to be writers). Some are funny. Some are sad. Many are amazing. I don’t always immediately rush to listen because some of the episodes/stories are hit and miss. But when they hit, it’s a 9th inning game-winning grand slam to win the World Series. #8 – The TED Radio Hour: If you like TED talks, you will like this. It combines clips from the talks with interviews with the speakers. Guy Raz went to the Ira Glass School of Announcing, so you’ll note similarities in his style. #9 – Planet Money: This was one of the first podcasts I started listening to and it led me to many others, for which I am grateful. It’s also a relatively short podcast that hammers home one or two basic ideas. So you really do understand by the end. #10 – Pop Culture Happy Hour: Four people talking about your favourite TV, movies and occasionally music and less occasionally books. It’s a smart way to hear about good movies and shows that your friends aren’t posting on their Facebook wall. They can put me things that I’m happy I know about. #11: 99% Invisible: This podcast tells stories about design in society, like the phone booth in the middle of the Mojave dessert that some dude heard about, called relentlessly until someone eventually picked up. Or the real-life woman who was the model for much of the bronze statues around New York. #12 – The Gist: Mike Pesca is one of the best interviewers you’ve not heard of. His style is so informal and he’s funny and smart. He knows sports and politics. Because it’s a daily podcast, I tend to listen less frequently that if it was a weekly one. 1. My street turns into a Shopkins trading market at least twice a week, which is teaching my kids about making deals. 2. Shopkins inventory is counted out loud several times a day, which is teaching my kids that counting has a real purpose beyond showing off that you can make it to 100. 3. The Shopkins inventory sheet is read again and again, which demonstrates that you can read to learn, not just learn to read. 4. New words have been added to my kids’ vocabulary, including duplicates, common, rare, ultra-rare, limited edition, special edition, and blind basket. You win, Shopkins. My kids are addicted to your profit-making toy. But I’m going to have the last laugh. I know your eyes got wet watching Inside Out with your kids at the movie theatre. The story gets you halfway there with the themes of growing up and losing the memories of early childhood, like invisible friends and are carefree joy. The animation pushes you to the edge with incredible emotional range of its virtual actors. But it’s the music that knocks your feet from under you. What music, you ask? There was music? While watching Inside Out, I was conscious of the subtle piano notes that signalled a sad scene. They reminded me of the musical notes from Lost. They did their job every time. You can listen below. You can buy the Inside Out original soundtrack at Amazon.ca or wherever you get the stuff. 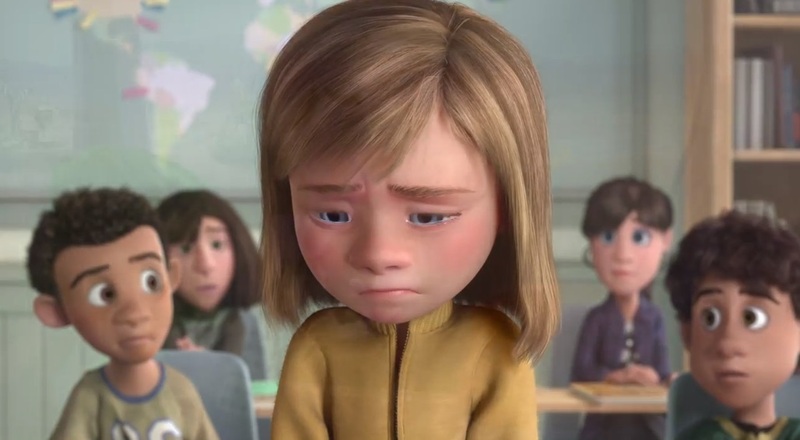 Go see Inside Out with your kids. Bring tissue and casually wipe your eyes in the dark theatre. Then give your kids a giant hug. Becoming carbon neutral means that if you want to pollute a little, you have to clean the air a little too in the same proportion. Drive car? Then plant a tree. I propose a less grand, but more easily attainable initiative that everyone can do immediately. Become shopping-cart neutral. Here’s my idea: if you plan on bringing your full shopping cart to the parking lot and leaving it in those parking lot huts, no problem. Just bring in someone else’s shopping cart from the parking lot before you start shopping. When you do this, you have not added to the net shopping carts in the parking lot. You just removed one and later added one. You are are now shopping-cart neutral. You will feel like a good person, and people who see you do it will believe you are a good person. Note: the author worked at a supermarket for many years and was that guy who had to bring in all those carts. He wishes someone else had floated this idea back then. 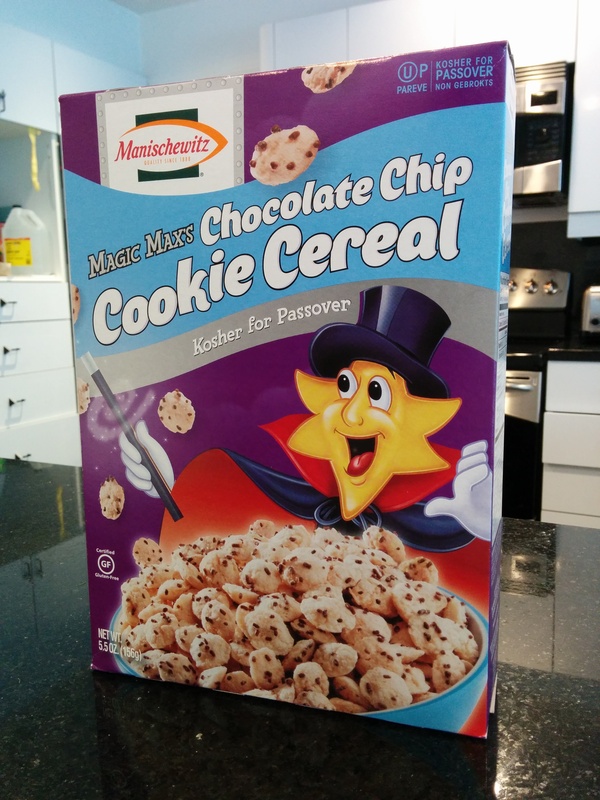 We bought Manischewitz-brand Magic Max’s Chocolate Chip Cookie Cereal lasy week because the photo on the box made it look so darn good with chocolate sprinkles galore. 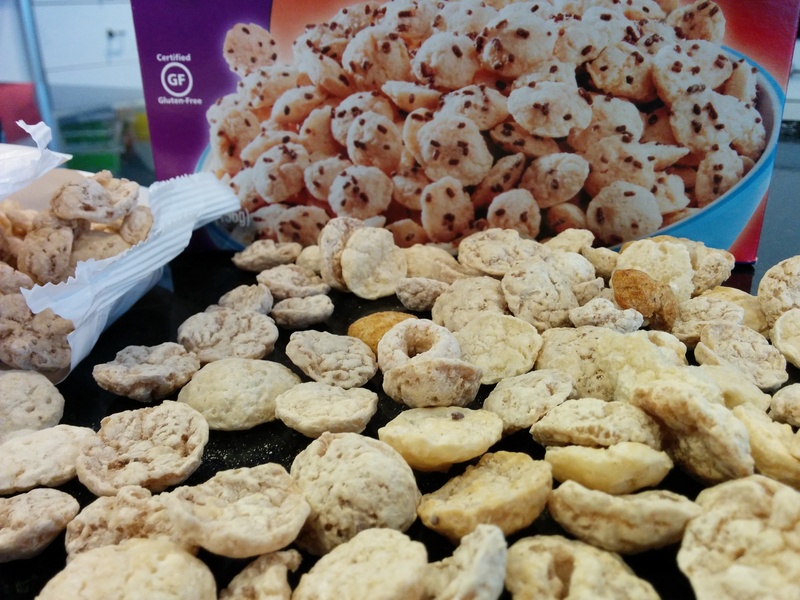 It even looks better than Cookie Crisp cereal. Magic Max uses his powers to shrink the inside bag. The second disappointment was the look of the actual cereal. It was not exactly as pictured on the box. And there were also a few Sunny O’s in there. Something else looks like a chocolate version of the Chocolate Chip Cookie Cereal. 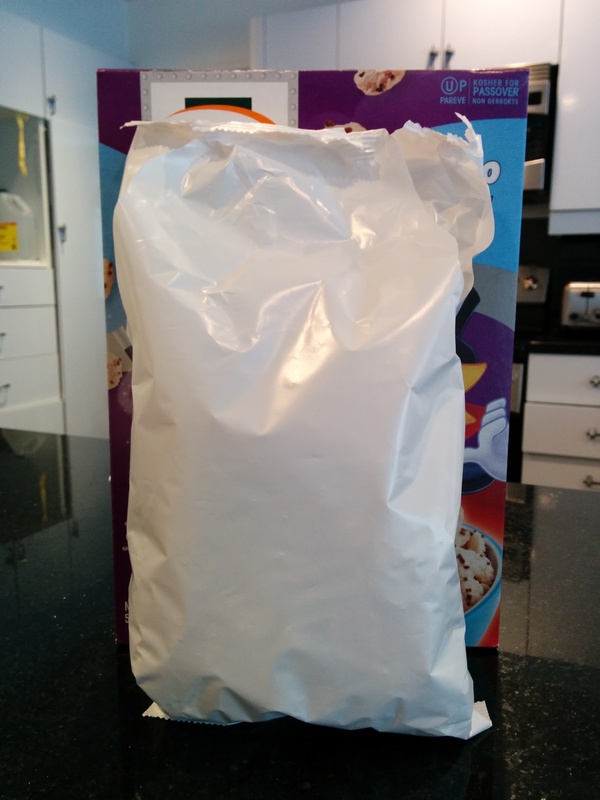 Maybe it’s another cereal from Manischewitz or the regular cereal got caught in the cocoa powder too long. Did Magic Max make the sprinkles disappear? The final disappointment was the smell. My wife thinks it went bad. I’m not sure. It might just be the regular smell. The best before date is August 20, 2015. We bought it at the IGA on Salaberry near the Marché de l’ouest. I’ve contacted the people at Manischewitz to ask about whether the expiry date indicates it was from last year’s stock or this year’s. I’ll update this when I get the answer. Bottom line: enjoy your matzoh and jam and forget these cereals.